This rare collection highlights the turn of the century logging industry boom. You do get to witness how much exploitation the industry took part in of our natural resources, without much consideration of the consequences. This rare collection highlights the turn of the century logging industry boom. You do get to witness how much exploitation the industry took part in of our natural resources, without much consideration of the consequences. Regardless of your position on the matter, you will find this collection entertaining, interesting, and educational. Great for lumberjacks, educators, and scholars alike. Condensed version of Golden Spike Celebration on 10/23/14 for the completion of the Northwestern Pacific Railroad, held at Cain Rock, Humboldt County, California. 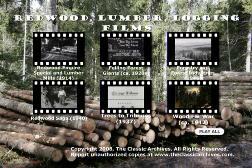 This 20s film shows logging and lumber cutting practices in the Pacific Northwest, including the felling of giant redwoods. This is quite interesting from a historical perspective, since the film has a raw, rough quality that convinces you that you're seeing the real deal. Interest is added by showing some of the more esoteric parts of the lumberjack's job, such as shoeing the oxen, though their general treatment of the beasts might upset animal lovers. All in all, this is an interesting portrait of logging practices during the 20s. Forest rangers at work and people engaged in harvesting, processing, and distributing forest products. Another film in the "Your Life at Work" series, this one goes over careers in forestry, covering both conservation work and the lumber industry. Cutting, loading, transportation, mill sawing and finishing operations of the Northern California's redwood lumber industry. Forest production and its strategic importance during wartime. In Kodachrome. Kinda of a strange war related film regarding wood and wood products from the US Forest Service. The film starts out with a narrator emphasizing the importance of wood for the war effort, with the constant repeating of the mantra "Wood for war, wood for peace." All the various uses for wood are listed off. Learn How newspapers are produced, beginning in the forest. This film takes you through the process from cutting down the trees and then the whole production that needs to take place before you get newspaper.